Capt. Charles D. Robinson, 29, was a Special Forces officer assigned to 1st Battalion, 7th Special Forces Group (Airborne) at Fort Bragg, N.C. 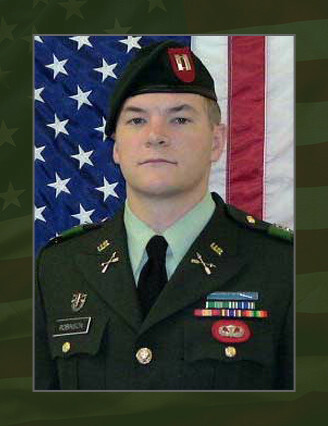 He was killed in action while supporting Operation Enduring Freedom on June 3, 2005, when an enemy improvised explosive device exploded near his Ground Mobility Vehicle during operations in the vicinity of Orgun-e, Afghanistan. Robinson deployed to Afghanistan in January 2005 in support of the Global War on Terrorism. A resident of Haddon Heights, N.J., Robinson was commissioned in the Army immediately following graduation from Cedarville College in Ohio May 1998, where he earned a bachelor’s degree in foreign trade. His first military assignment was with the 504th Parachute Infantry Regiment, 82nd Airborne Division, Fort Bragg, N.C.
Robinson graduated from the Special Forces Qualification Course and was assigned to 7th SFG in December 2003. Robinson’s military education and schools include the Infantry Officer Basic Course, Infantry Mortar Platoon Officer Course, Ranger School, Infantry Officer Advanced Course, Nuclear Biological Chemical Officer Course, Special Forces Qualification Course, Combined Armed Service Support School, Special Forces Assessment and Selection, Survival, Evasion, Resistance and Escape Course and Airborne School. His awards and decorations include the Army Commendation Medal, the Army Achievement Medal, the National Defense Service Medal, the Global War on Terrorism Service Medal, the Army Service Ribbon, the Parachutist Badge, the Combat Infantryman Badge, the Expert Infantryman Badge, the Ranger Tab and the Special Forces Tab. He was posthumously awarded the Bronze Star Medal, Purple Heart, the Meritorious Service Medal, and the Afghanistan Campaign Medal. Robinson is survived by his wife, Laura; and parents, Charles and Janet Robinson of Brown Mills, N.J.